We meet every Monday, Tuesday, Wednesday, Thursday, Friday and Saturday and details of the various venues can be found within the 'where we meet' section. Our Friday and Saturday venues remain the same throughout the year but the Wednesday venue changes every 6 weeks or so to allow us to provide different routes both on and off road. Our Monday, Tuesday and Thursday night meets are rep sessions organised by Graham Fletcher, Michael Grant and others. Monday and Thursday are usually at the Prince of Wales Track whilst Tuesday is hill reps. Further details are available from the links to the left of this description. Please Email Graham if you have any questions. We provide several groups of differing speeds and distances on a Wednesday night, varying from 11 minute miling (4 miles in distance) to 7 minute miling (5-7 miles in distance). Friday night is an opportunity for a informal gathering at the Norwood Arms at 7pm with no official leader, and might not even happen some weeks as there is so much going on the rest of the week! Check the Almost Athletes Facebook and answer an invite if there is one otherwise please add your own. Overall, it is an end of the week, relaxed, social run and numbers vary from week to week. On Saturday mornings we have a medium-sized group on Cleeve Hill, starting from Cleeve Hill Golf Club car park at 9am. The off road route varies in length from 7 or 8 miles to an extended 11 or 12 if required. On Saturday morning, 9am there is also the local Parkrun at Pittville Park. 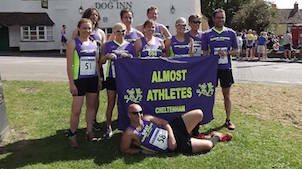 This is not an Almost Athletes event but AAs are very much involved in both participating and helping to run it. Parkrun is a national initiative based on a weekly free 5km race open to all regradless of speed from sprinting to walking. Please register (also free) at http://www.parkrun.org.uk/ and printout your barcode before attending. We are always looking for volunteers to help marshal or sweep our groups - if you have been running with us for a while and are willing to assist please send an e-mail to almostathletes@hotmail.com, or speak to Graham Fletcher on a Wednesday night.